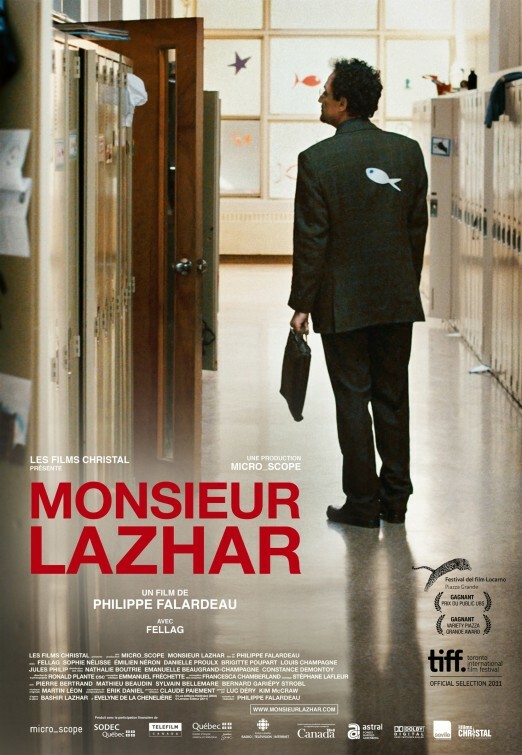 Being in a particularly depressed place in my own life, I hadn’t relished the idea of watching a film about schoolchildren and their refugee teacher coping with issues surrounding death, but in a very understated and sincere way MONSIEUR LAZHAR managed to completely charm me with its emotional erudition and cinematic catharsis. There are so many ways this film could have rung a false and tired tone, but French Canadian director Phillippe Falardeau deftly sidesteps any pernicious preciousness and the ploddingly predictable plot points normally associated with inspirational teacher tales as he unpacks a powerful story with cameras that never linger too long and dialogue that never says too much. The result speaks volumes about the durability of the human spirit. The lift you feel by the end is not because of some neat and tidy thematic denouement, but because the film remains life-sized and unassuming, aiming for neither arthouse angst nor Peorian sentimentalism. Soon after Simon (Émilien Néron) discovers his class's beloved teacher hanging from the ceiling of his homeroom, the mysterious Algerian substitute Bachir Lazhar (Mohamed Saïd Fellag) steps in as her replacement. Bachir's wife and children had been killed as reprisal for her political writings, which had criticized the policy of national reconciliation for extending amnesty to those involved in the crimes and massacres of the 1990s. Indeed, one of the most painful scenes in the film is watching Bachir recount his unfathomable loss while bathed in a plaintive fluorescence and enduring the hostile interrogation of an immigration commissioner. A perhaps even more heart-rending scene comes later when one of Bachir's students, Alice (Sophie Nélisse), who had also seen her teacher's body, becomes the first person brave enough to speak openly about her feelings regarding the suicide as she delivers a moving speech to the rest of the class. This contrasts sharply with her classmate Simon's anguished reluctance to talk about it due to his own immense feelings of guilt. That guilt is echoed in Bachir's own difficulty speaking of his past, whether to his pupils or to the drama coach, Claire Lajoie (Brigitte Poupart), who appears to have a romantic interest in him. We casually witness how an aversion to vulnerability makes us hold onto painful experiences and miss vital connections when we are afraid to share. MONSIEUR LAZHAR also explores administrative restrictions and cultural norms that suppress the freedom to speak about sensitive topics, and the damage caused by such avoidance. Bachir wants to distribute Alice's speech to the rest of the school, but that idea is immediately shot down by the school's principal. In fact, many aspects of Bachir's more traditional, hands-on pedagogical style come into conflict with a more colorful but also sometimes impersonally regimented Western approach that sharply restricts the role of a teacher, yielding authority to parents, administrators, and even the children. As Bachir asserts incredulously during a parent-teacher conference while the other faculty members are carefully ladling out fluffy student appraisals, “students are not in a position to judge a teacher’s behavior.” In this environment, however, Bachir must adjust to numerous aspects of this foreign culture, even learning the nuances of a language spoken by those who once colonized his home country. While definitely not a feel-good movie in the classic sense, MONSIEUR LAZHAR inspires with its deep sense of humanity. 3 1/2 out of 4 stars.